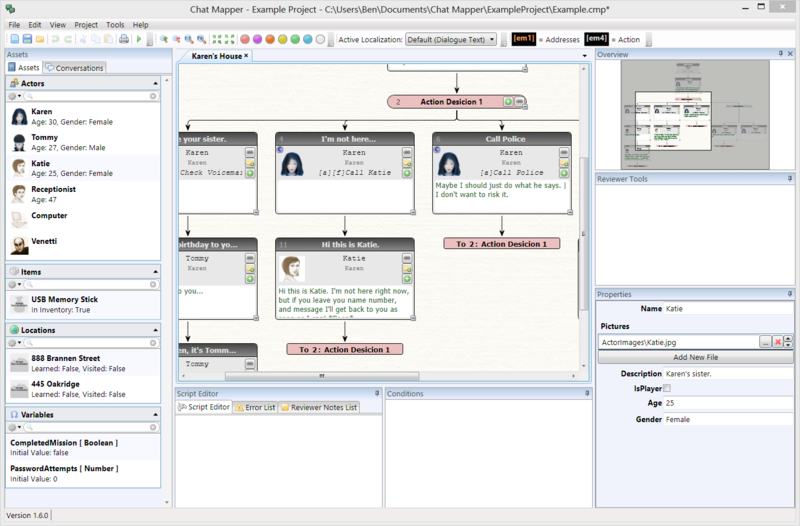 Using the latest development tools available, Chat Mapper is designed to be as user-friendly and stylish as possible. Typically there are several different ways to accomplish tasks through on-screen buttons, menu options, shortcut keys, or right-click context menus. The layout is fully configurable with tabs and hidden interface elements so you can concentrate on the content. After researching many methods for displaying complex non-linear dialogue, we found that the easiest to grasp intuitively is the tree graph. With a “root” node defining the entrance point of the conversation, dialogue options stem from this to form what looks like a tree. Links can be defined between any two nodes, but only one is shown as a “primary” link for simplicity with the others as “connector” links. Chat Mapper also supports sub-trees via group nodes, links to other conversation, and links to other project files for easy organization. While designing a complex conversation, how do you know it will work as intended in the final product? That is where the conversation simulator excels. The simulator will present your dialogue tree as a game complete with audio, graphics, and dialogue menus. You can also use the simulator to debug your logic by tracking variables and finding Lua script errors. With a license, you can save simulator states and return back to any point in the simulation with just a button click. In almost every non-linear dialogue tree, there are choices presented to the player during the course of the interaction. With Chat Mapper, it is easy to define conditions using Lua to control which tree branches are available based on previous choices. For example, you may only want a certain dialogue to be offered when the player has a specific inventory item. You may also define Lua scripts to be executed when the dialogue is displayed to set custom variable values, useful for assigning scores to correct choices. After completing your project, you may want to create a screenplay document to pass along to voice talent or editors. 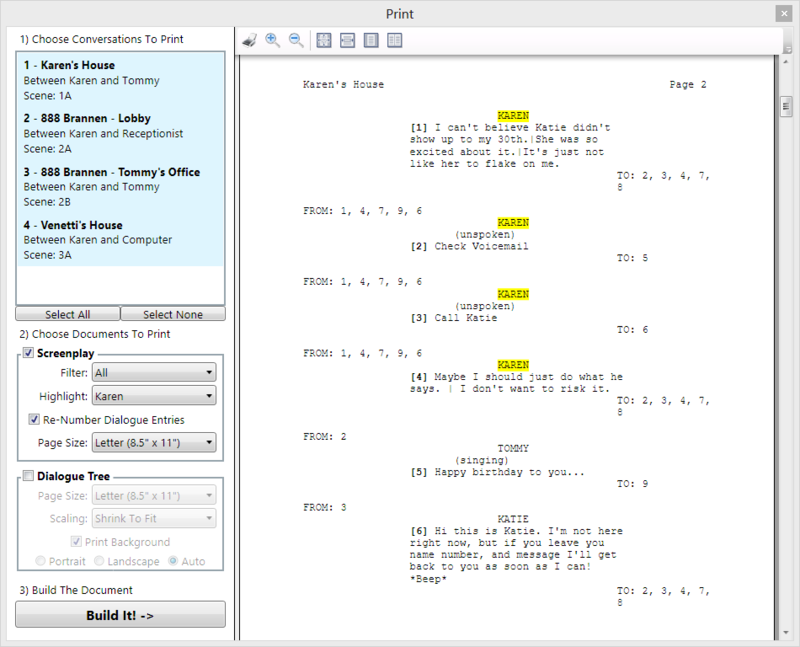 The screenplay can also be automatically filtered to show or highlight only a specific character’s lines. The script generated follows the internationally accepted formatting for screenplays and can be exported to other editors like Microsoft Word. 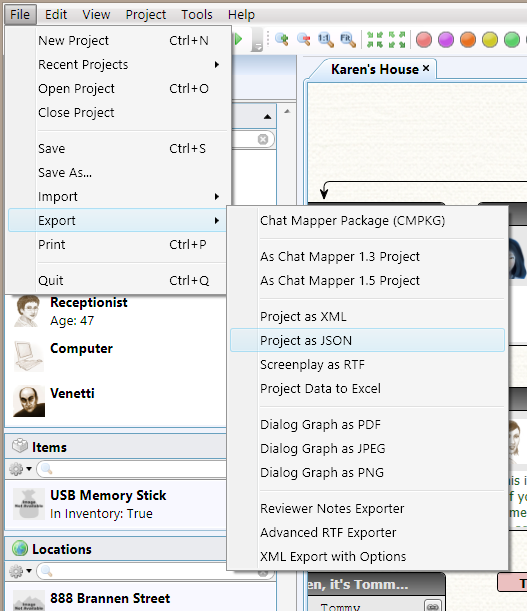 With an indie license, you can export your data from Chat Mapper in a number of formats for import into your game engine, or e-learning system. Common export formats include XML, JSON, RTF, PDF, JPEG, Excel, and Zip packages. If you need more formats, we also offer a custom exporter development kit and/or custom exporter creation services. A set of reviewer tools aids in the process of editing and approval of conversations. Reviewer Tools allows locking of the conversation from editing and setting review status of nodes. It allows for lists of comments to be attached to nodes by writers and reviewers. A summary of all reviewer notes in your project is made available, double-clicking an entry from the list jumps to the corresponding node in the tree. Using the custom asset field settings, multiple languages can be defined for the dialogue text of each node in the tree. By exporting to Excel, these fields can quickly be localized and imported back into your conversation. 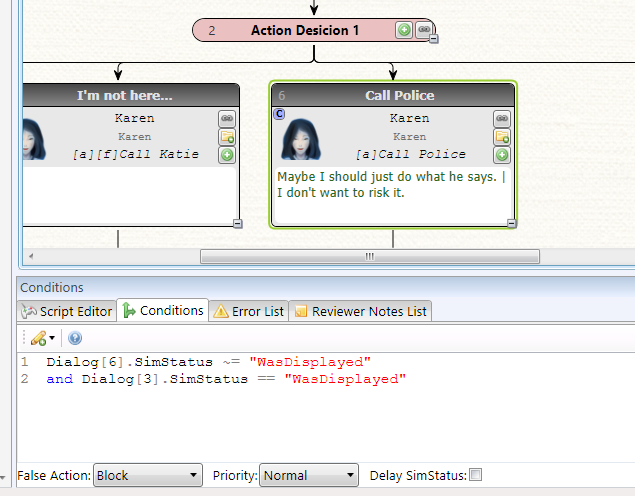 Once written, the active localization shown in the tree can be switched with the click of a button. A set of reviewer tools also aids in the process of editing and approval. Note: these features are only available with a commercial license. You can automate the export process using command line tools without launching the Chat Mapper GUI. Note: this option is only available for commercial license holders. If the export options are not sufficient for your application, Chat Mapper offers a fully featured software development kit that will allow you to write your own exporter in .NET. Using the Chat Mapper SDK, you will have full access to all project data and your exporter can be run from within the main application. Note: this option is only available for commercial license holders.